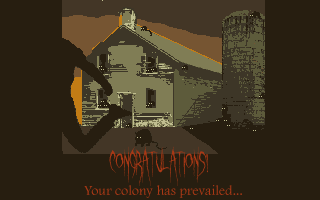 Made for the May 2018 MAGS competition, this game is a turn-based strategy game where you manage a colony of rats. Your purpose? To survive, and expand! Forage for food, breed, lay low to fool those pesky humans into thinking you've gone, expand your next, upgrade your foraging, trap evasion and digging skills... don't let your food supply run out or your rats all die off, and if you can, expand your colony to a thousand rats to win the game! Please only use LEFT-CLICK due to a small (but highly problematic!) bug I haven't had time to fix yet. Title screen and testing by Antoni Langen. "Solid strategic game. It's not very difficult but it is rewarding as long as it lasts." "For a MAGS entry this is a really good effort and shows huge potential for development. I played the game to kill 5 minutes. 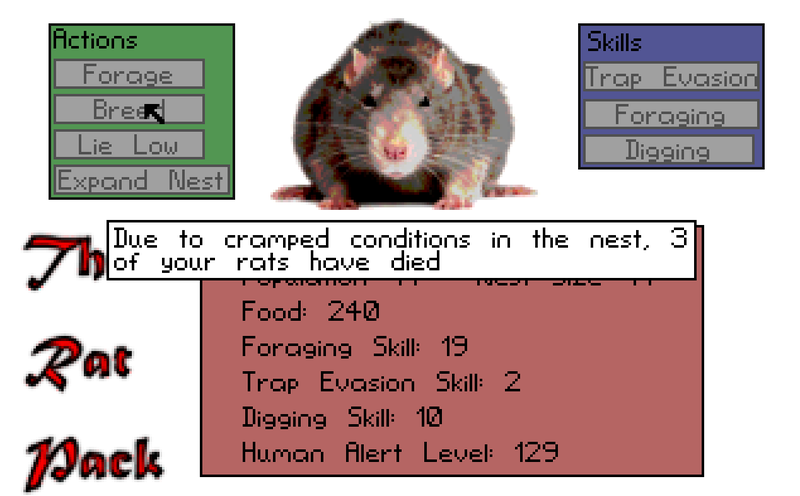 An hour later I was overlord of a huge rat empire. But alas, greed got the better of me and things fell apart very quickly once the humans upgraded their traps. Give it a go- very simple concept that is easy to pick up and play and the balance feels just right!" 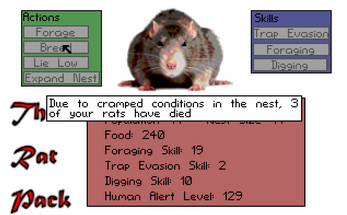 "A game about playing with variables to obtain a successful outcome of a family of rats. This game has a single screen and is quite self explanatory. Getting a good balance and moving on was good fun. However, the mouse disappearing was game breaking and quite annoying and MUST be sorted as I would have liked to have gotten further than I had.. Effort went into coding the variables. All in all a fun game that I could play more of given a fix of the mouse vanishing. I found it quite enjoyable and could spend quite some time playing around with it. Good effort for a nice game. " "First time round, took me less than a minute to die... and wonder "what the hell happened?"... Second time I was in a roll and was progressing nicely, until I got a bit carried away... Maybe killing the entire colony before the food reaches zero is a bit unintuitive. Unzip and run winsetup for options, ratpack for the game. The Rat Pack is a winner! StickyThose who have managed to complete the game - how many turns did you do it in?